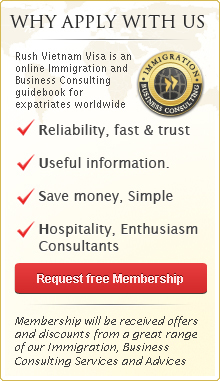 This is a commercial website to provide visa service online. We help you to get visa approval letter as a service. This website does not belong to Government or Immigration Department of Vietnam. Service fee needs to be paid in full in advance to process the visa approval letter in 1 working day (urgent service) or 2 working days (normal service) and 4 working hours (super urgent service). See table below for details. + Morning: If your online application is submitted before 08:00 am in Vietnam (GMT +7) and approved, the Letter of Approval will be sent to you by 2:30 pm on the same day. + Afternoon: If your online application is submitted before 09:30 am in Vietnam (GMT +7) and approved, the Letter of Approval will be sent to you by 6:00 pm on the same day. STAMPING FEE: To have your visa, stamped, you need to pay in cash directly to Immigration Departmentat Vietnam international airport. ASSISTANT FEE $25: We offer Assistant Service to save time waiting in a long queue at immigration checkpoint at Vietnam Airports. Our staff will take care of every procedure right upon your arrival until your acquirement of stamped Vietnam visa. Step 3:You will need to present our staff your visa approval letter, passport, 2 photos (4x6cmwith white background), entry & exit form, stamping fee and subsequently our staff will handle all necessary procedures to get your visa stamped. Step 4:You will have back your passport with stamped Vietnam Visa from our staff.